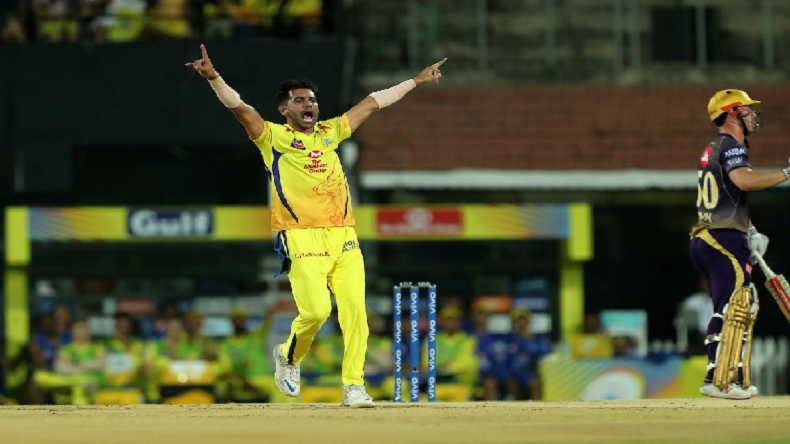 IPL 2019: Deepak Chahar stars as Chennai Super Kings beat Kolkata Knight Riders by 7 wickets, MS Dhoni-led CSK reclaims top spot: Chennai Super Kings (CSK) on Tuesday registered a fifth win in the IPL 2019 by burying strong Kolkata Knight Riders (KKR). MS Dhoni-led CSK replaced Dinesh Karthik-led KKR from the top spot. Chennai bowlers wreaked havoc in Kolkata side. Deepak Chahar, Imran Tahir and Harbhajan Singh bowled very well and restricted Kolkata to a low total. IPL 2019: Deepak Chahar stars as Chennai Super Kings beat Kolkata Knight Riders by 7 wickets, MS Dhoni-led CSK reclaims top spot: Chennai Super Kings reclaimed top spot in the Indian Premier League (IPL) points table by defeating Kolkata Knight Riders (KKR) at MA Chidambaram Stadium, Chennai. This was Chennai’s fifth win in the Vivo IPL 2019. The team has only lost a single game out of six. All credits to Chennai bowlers who restricted Kolkata on a low total. Kolkata suffered second loss in the series. Batting second, Chennai comfortably chased down the 108 target with 16 balls to spare. They only lost three wickets in the run chase. CSK did not get a steady start as the first wicket fell for 18 runs in the third over. Shane Watson smashed two boundaries and a six and made 17 runs off 9 balls. He was dismissed by Sunil Narine. The second wicket fell for 35 runs when Suresh Raina was dismissed for 14 off 13 balls. Chennai lost the third wicket for 81 when Ambati Rayudu was departed by Piyush Chawla. After that Chennai did not lose any wicket and registered a massive win over strong Kolkata. As comprehensive as it can get for @ChennaiIPL at the Chepauk. Faf du Plessis scored unbeaten 43 off 45 balls while Kedar Jadhav remained unbeaten on 8 off 8 balls. Earlier, batting first the strong Chennai side failed to set a challengable target. In the very first over, Deepak Chahar dismissed Chris Lynn without troubling the scorer. In the second over, Harbhajan Singh stuck and sent Sunil Narine back for six runs. The wickets of Kolkata fell like a pack of cards.